Anyone who has ever entertained the notion of "little people" living furtively among us will adore this artfully spun classic. 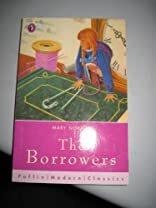 The Borrowers--a Carnegie Medal winner, a Lewis Carroll Shelf Award book, and an ALA Distinguished Book--has stolen the hearts of thousands of readers since its 1953 publication. Mary Norton (1903-1993) creates a make-believe world in which tiny people live hidden from humankind beneath the floorboards of a quiet country house in England. Pod, Homily, and daughter Arrietty of the diminutive Clock family outfit their subterranean quarters with the tidbits and trinkets they've "borrowed" from "human beans," employing matchboxes for storage and postage stamps for paintings. Readers will delight in the resourceful way the Borrowers recycle household objects. For example, "Homily had made her a small pair of Turkish bloomers from two glove fingers for 'knocking about in the mornings.'" A fantastic series about a tiny race of people who "borrow" things to survive. Have you ever put something down and then when you went to find it again it was gone? That's the Borrowers at work! Don't even bother with the Americanised movie version - it's nothing like the original books. There are five in the series and I recommend you read them all! I was delighted to find out that the illustrators of this book, Beth and Joe Krush, were close family friends of a dear friend. Beth Krush died recently and should be remembered for her delightful work. Although I loved every word of this book, the illustrations also stayed with me throughout my life. Arrietty Clock is one of the best heroines in children's literature. She combines a trusting nature with a strong desire for adventure. And, of course, she also has that irresistible urge to write. I can't imagine my childhood without this book.